Gurudwara is the place where one can learn about rituals and performs religious activities. The literal meaning of Gurudwara is "Gateway to Guru." Gurudwara always keeps its doors open to all the devotees irrespective of their creed and faith. There are hundreds of Gurudwaras in and around Himachal Pradesh; these are the places where one can meet and greet god. Immerse yourself in Punjab culture and Sikh religion on a trip to Himachal Pradesh. The Gurudwaras in Himachal Pradesh holds great historical significance apart from religious aspects. One exclusive feature of the Gurudwaras is that they don't have an altar or any idol to worship. The focal point of worship is the 'The Guru Granth Sahib' or 'Adi Granth' which contains religious scriptures. The "Guru Granth Sahib Ji" is considered as the sovereign Guru following the footstep of 11 Sikh Gurus. It is said the people who take a holy dip in the hot water of Manikaran Sahib Gurudwara reservoir can get relief from all kind of diseases. The literal meaning of the term "Manikaran" is the Jewel from the Ear.' As per the stories, once a giant snake tried to steal the earring from Goddess Parvati while she was bathing; later the snake snuffed the earrings into the ground, which released the hot springs. The water emerging from the ground is hot enough to boil rice. The Gurdwara has the capacity of housing around 4000 devotees. 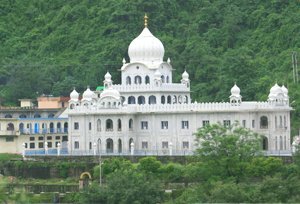 Gurudwara Rewalsar in Rewalsar is yet another important Gurudawara in Himachal Pradesh. The tourist will have to climb 108 stairs to reach the doorstep of the Gurudwara, and it is also believed that the temple is constructed at the same place where Guru Gobind Singh met Raja Siddh Singh. 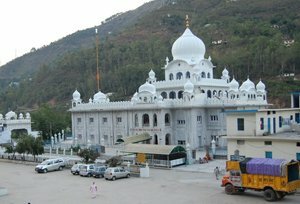 An important pilgrimage site, Gurudwara Sri Paonta Sahib (Simour) is the most famed Gurudwara in Himachal Pradesh. The place carries great importance because it is believed that this was the place where Guru Gobind Singh wrote the pious Dasam Granth. 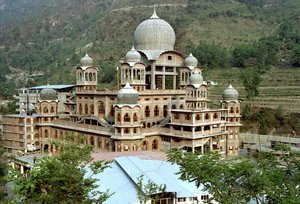 Within the area of Himachal Pradesh, there are many other Gurudwaras like Gurdwara Anand Karaj Sthan Patshahi Dasvin in Una (the place where the marriage of Guru Gobind Singh was performed), Gurudwara Shri Damdama Sahib in Mandi, Gurudwara Triveni Sahib in Basantpur, Gurudwara Dera Baba Bharbhag in Una, Gurudwara Bhagani Sahib in Sirmour, Gurudwara Naduan in Kangra, and Gurudwara Paur Sahib in Bilaspur. Apart from aficionados, tourists throng the destination from various parts of the country to pay homage at these shrines. There are more than 200 Gurudwaras established across India. Sikhs have managed some of the cleanest and organized places of worship in India. Take a holy plunge into these divine places on your next tour to Himachal Pradesh, and explore the city like never before.